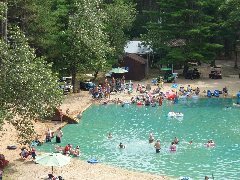 Large sand bottom pond for swimming and relaxing. Enjoy the sand beach and playground area. Relaxing bar area with great bar snacks and drinks available. Shaded sites right next to the playground area. Have a picnic by the beach. 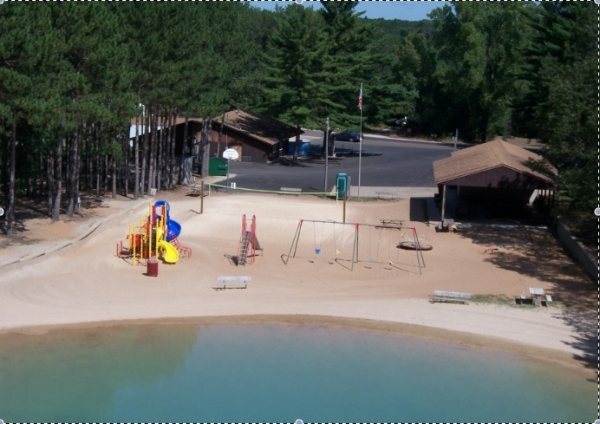 Our park has a large sandy beach area surrounding the swimming pond. There is a volleyball court and a large playground for your entertainment. A new 9 Hole Mini-Golf course has been added for your enjoyment. We have a full service bar with pizza's and typical bar food available. It is a great place to meet and mix with fellow campers and friends. We are located 3 miles North of Redgranite on Cty EE in beautiful Waushara County. Redgranite is located on Highway 21, 30 miles west of Oshkosh Wisconsin. Design Your Own Website, Today!